SLUMPED against a bathroom mirror inside his changerooms at Melbourne’s Convention Centre, Anthony Mundine has seen better days. Wearing nothing but his jocks, the now former WBC silver super welterweight champion can’t hide the beating he just took at the hands of American Charles Hatley in the ring just minutes ago. A split on his eyebrow has already been stitched up and the area from his left hip to his armpit - the target of repeated Hatley right hand body shots — is still red raw. Mundine looked every one of his 40 years during an 11th round TKO defeat, going down three times in the second round from shots he would have weathered on his feet 10 years ago. But his strength, sapped by too many years trying to keep his weight below 70kgs (154 pounds) was nowhere to be found, as he was bullied by the younger, more powerful Texan. “They were just catching me enough to put me off balance and take my equilibrium away, “ Mundine said. As they inevitably do in sport, thoughts quickly turn to what will come next for one of Australia’s most controversial athletes. Mundine is happy to concede his time at the super welterweight limit is up — he’s sick of cutting weight and has never been the best at dieting anyway. Dreams of luring top-level stars like “Canelo” Alvarez and Miguel Cotto will remain just that — and may prompt Mundine to question why he didn’t start pursuing names like that earlier in his career when too often he took the easy pay day against unheralded fighters in Australia. A 30-year-old Mundine would have been a much different proposition for a fighter like 29-year-old Hatley. “I tried to conquer that mountain at 154 (pounds) but it’s not easy to make (the weight),” Mundine says. Just outside his bathroom door about 30 members of Mundine’s clan — including fellow boxers Sonny Bill Williams, Billy Dib and Willis Meehan, a handful of kids and his father, Tony — sit and wonder whether these days are over. 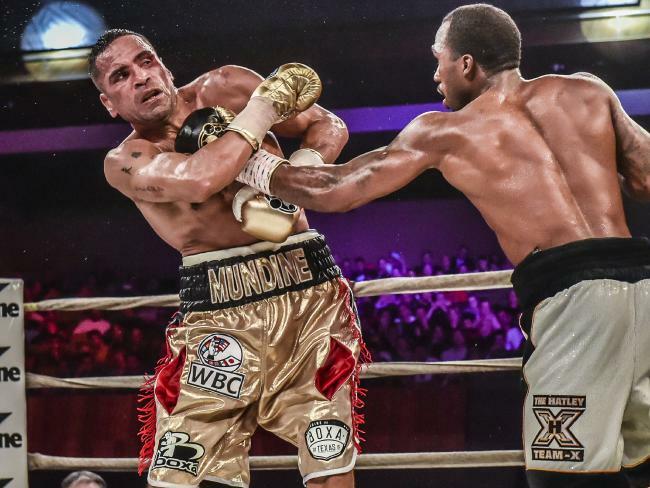 It’s not advisable for Mundine to keep copping the beatings he’s copped in two of his past three fights. But like all fighters it’s the performance in between — a sensational win against Sergey Rabchenko — which he’ll think about most when deciding whether to go on. “To be honest, I just want to spend time with my family and get my body right ... Once I get my body right I’ll get my mind right and I’ll figure out what I want to do. If I call it a day or have a showdown. The showdown he refers to is a much-discussed rematch against Danny Green. Green has already posted to his Facebook page in the wake of Mundine’s defeat, but the former rugby league star declines when news.com.au offers to show it to him. Mundine should think long and hard before deciding whether to fight one more time. The dangers of this sport were put on devastating display earlier in the night when former AFL player Shane Tuck made his professional debut and was carried out of the ring on a stretcher. You’d worry about sending the Mundine of last night into the lion’s den with a much bigger man like Green, but it’s also fair to assume Mundine will look better when he’s put on some weight and overcome injuries to his elbows and hip. “I’ve been in other fights with injuries before ... the Antwun Echols fight,” Mundine said. At the end of day, it’s not worth spending too much time wondering if Mundine will say yes to Green. There’s too much cash on the line and fighters rarely walk away when they should. And that’s what Mundine remains when you look into his eye. A fighter. Beaten tonight, but not broken.